Our anniversary Sunday went well with 273. We had 175 adults, 10 of whom were visitors. Three of the new adults trusted Christ. We had 98 children. Please pray for our last campaign Sunday this weekend. The Cromwells are getting accustomed to Mexico. It has been a joy to fellowship with them. 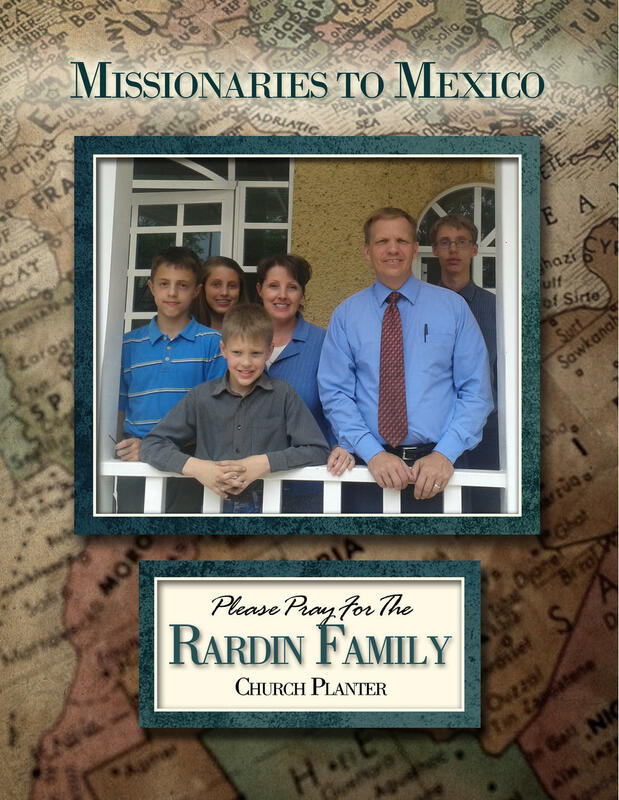 This is their third time helping a church on the foreign field in the absence of the missionary pastor. A week before I arrived in Mexico, someone had stolen the side mirror of our 15-passenger van. I went to a place that sells auto body parts and the young man I was dealing with called the boss who was away to come and give the price, availability, etc. While we waited, we started talking about eternal things and he said he would be going to heaven because he was pretty good. Then he let me know he was planning to marry the girl we was living with. I said, "But Juan, you just said you were pretty good, but you're living in fornication and quoted I Corinthians 6. Seeing conviction there, I continued to witness and , at the end, he bowed his head with me and prayed repenting of his sin and trusting in Christ. He later asked where our church was so he could attend. As we were praying, Sergio, his boss came up to us. We took care of the mirror and, while Juan installed it, Sergio asked what we were doing when he walked up. He listened to the Gospel and then he asked if he could pray and trust Christ, which of course I said, "Sure!" and he did. If my mirror had not been robbed, I never would have met Juan and Sergio. Of course the 90 dollars to replace the mirror was worth it, for "what shall a man give in exchange for his soul?" 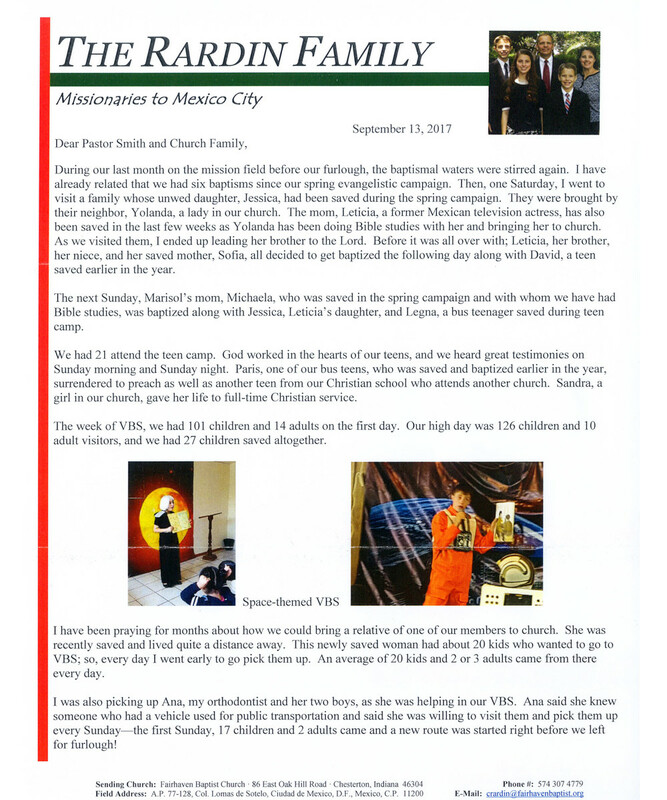 I will be leaving for Mexico City on Nov. 8 and returning to the States on Nov. 21 so that I can be there for the 13th anniversary of the church on the 12th of November..
Sunday was the first of our four-week fall evangelistic campaign. They had 266, 167 adults and 99 children. They had 167 on the buses! But the drive-in was down by about twenty. Oscar's bus had a goal of 40, but had 75 on the bus. It helps having his new wife, Nancy, who is a seasoned bus captain from the old church. Two blessings are that Raul, a lieutenant in a our church who has been coming for about a year, and his wife have decided to come to all the services; and Pablo, another soldier who has really been growing this year and whose wife was saved this year, has been coming out this last month on the Tuesday outreach to the Jews. Another blessing is to hear about 6 women and teenagers joining the other four men that go out on door-to-door soulwinning on Saturdays, apart from those that visit on the routes. 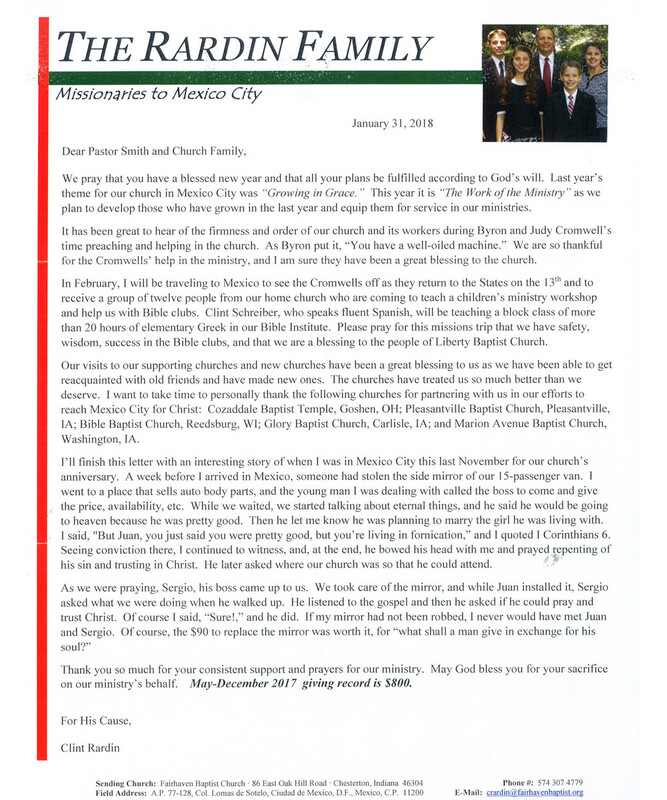 While I'm writing, I'd like to share the story of two people saved in the church services during our absence: Amerika is a twelve-year old girl whose parents, Anselmo and Katarina, were led to the Lord by one our bus captains, Gaspar, last fall and have been attending ever since. Anselmo has bad kidneys and is on dialysis six hours a day and cannot work. They struggle financially as Katarina does her best to provide for the family with a small store and selling tacos in the evening. Amerika is a big help to her in both tasks and has had to grow up quickly. This summer, Amerika brought the most visitors in VBS, but this fall Amerika was saved under Oscar’s preaching. Sofia and Lucia, are two retired military nurses, a lieutenant colonel and captain respectively, who were reached and baptized in this last year. Both are leaders in Amway here in Mexico and had been bringing their associate, Bernabe, to church since our last day in the church in August. Finally, this September, Bernabe.was also saved. 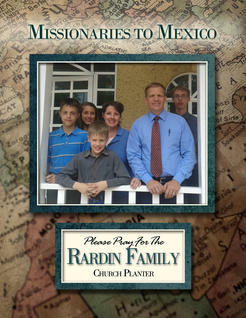 Please pray for the rest of the fall campaign that Liberty Baptist continues to have good success. Our VBS was a great success. Our high day was 126 and 10 adult visitors and we had 27 children saved. There was a sister of a woman in our church, whom she had led to the Lord, but lives quite a ways away where we do not have a route and I have been praying for months about how we could bring her to church. Her sister, Guillermina, told me her Juana, her newly saved sister, had about 20 kids who wanted to go to VBS; so every day I went early to go pick them up. An average of 20 kids and two or three adults came from there every day. I also was picking up Ana, my orthodontist, and her two boys as she was helping in our VBS. Ana said she knew someone who had a vehicle he uses for public transportation and said she was willing to visit them and pick them every Sunday and, on the first Sunday, 17 children and two adults came and a new route was started right before we left! Our closing day of VBS was on Sunday, the 6th. We had 251 in church as many of the children came back with their parents to see them do a program and receive their diplomas. 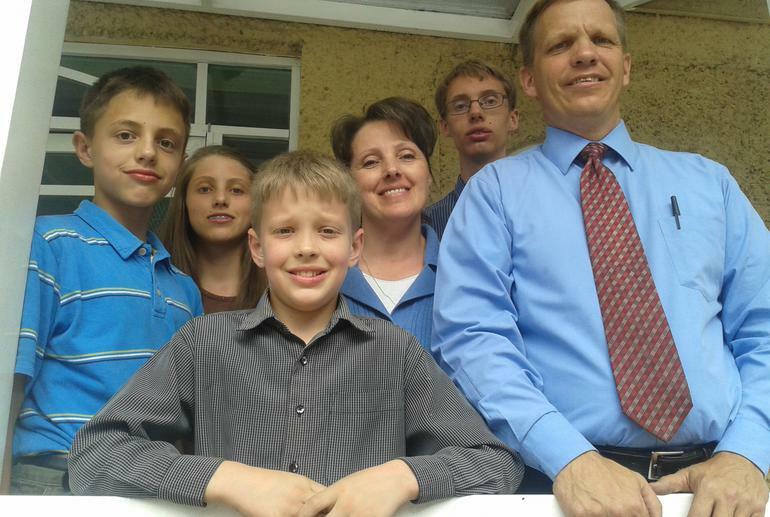 A couple of parents were saved in church. Our goal of reaching a couple of whole families were met again as the sister I mentioned continues to come with her grandkids and a couple families of Gaspar's route continue to attend, parents and all. My last week was spent in Salina Cruz, Oaxaca, in a church just a couple of a hundred yards from the Pacific Ocean. I preached a three-day evangelistic campaign were a lady they had reached through their VBS was saved as well as two adult grandchildren of the pastor. whose unwed daughter, Jessica, had been saved during the spring campaign. were baptized the following day with David. get kids signed up and now the kids are working hard to get other kids out. workers as it is for the kids. Thank you for your continued prayer for our spring campaign. Our spring campaign's are usually more low-keyed (except for Kid's Day), so our expectations for our Mother's Day emphasis (Mother's day is Wednesday, the 10th in Mexico) was an attendance of between 200-250, but God surprised us with an attendance of 276! --one of the non- Kid's Day highest attendances ever in the church -- and on another three-day holiday weekend (Friday was the famous 5 de Mayo). We had over 150 on the buses, 176 adults packing out our auditorium again, and 101 children. Four women came forward to be saved including Maria Louisa, a mother of the kids I visit on my small van route, who surprised us by coming with her children for the first time that morning. I could tell she was into the message; and at the first note of the piano at the invitation, she left right out of her place to come forward. Five children also made professions of faith. What has been great about this campaign is that the majority of the adults that have been saved are people that our people have been working with or that they know: Michaela, the mother of Marisol, who was saved the first campaign Sunday and returned this Sunday, has been coming off and on with her daughter for over a year. Guadalupe and her teenage daughter, Sofia, who were saved the second Sunday, had been coming off and on for several months on the military route and haven't missed since their salvation and Guadalupe's husband is now attending with them. Eufracia, who had been coming for moths with Irma, her sister-in-law (who was baptized last fall) was finally saved on Kid's Day and let me know about it this Sunday. Victor, also saved last week, has been coming off and on on the military route as well. Carlos, his wife, Maria Dulce, their two teenage daughters, and Maria's mother, Irma, all made a decision also on Kid's Day and are neighbors of Oscar, one of our Bible Institute students, whose sister invited them. They couldn't return this week, but told me they plan to return the following week. Jessica Denise is an unwed mother that was invited by another woman in our church,Yolanda, who lives in front of her house. Jessica came with her mother, a television actress, and she also made a decision on Kid's Day. Please pray as we follow up on these recently saved. Time is short as we only have three months before our furlough to see these new Christians baptized and grounded in the Word before our departure. Please pray for this Sunday as we do something we have never done before. Next Monday is Teacher's Day (ugh, another three-day weekend for the schools), so we are taking advantage of the holiday with Teacher's Appreciation Day this Sunday (we have six teachers in our church). Please pray as we cast the net again (our campaign theme) to see if we can fish for a few teachers for the Lord. We had a very good first day of the spring campaign. 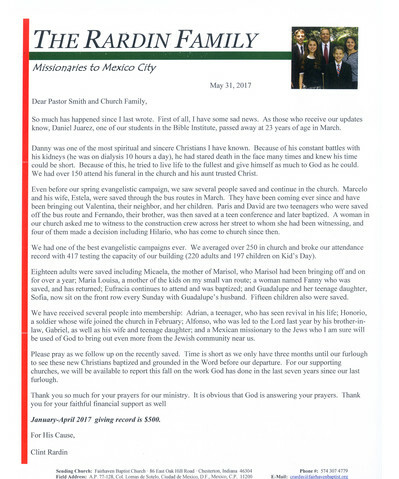 I usually dread having Easter Sunday as one of our campaign Sundays because Easter Sunday is a low day in Mexico as it is right in the middle of a two-week Easter vacation when even many of our own people leave the city. What a pleasant surprise to have 201 inspite of being down in the children's classes. We had 147 adults with the auditorium packed and many extra chairs put up. We had three saved including a young man among fourteen visitors (relatives) that Jehu, a man in our church, brought. We had almost 20 first-time visitors. 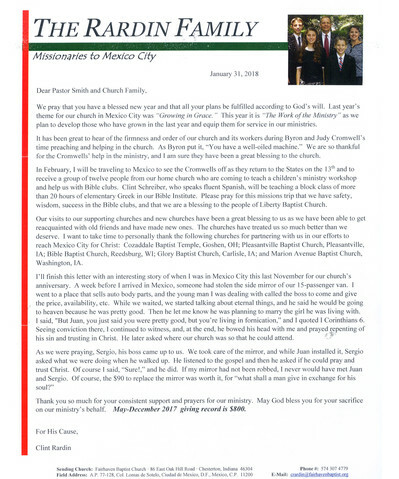 What was really exciting on Sunday was the salvation of Eunice, the mother of Marisol, who Marisol had been bringing off and on for over a year. We had been praying for her health and her salvation. Marisol is the lawyer and assistant of Joel, Mexico City's industrial police chief, whom he brought to church a couple of years ago and whom Rhonda led to the Lord and is now a member of our church. 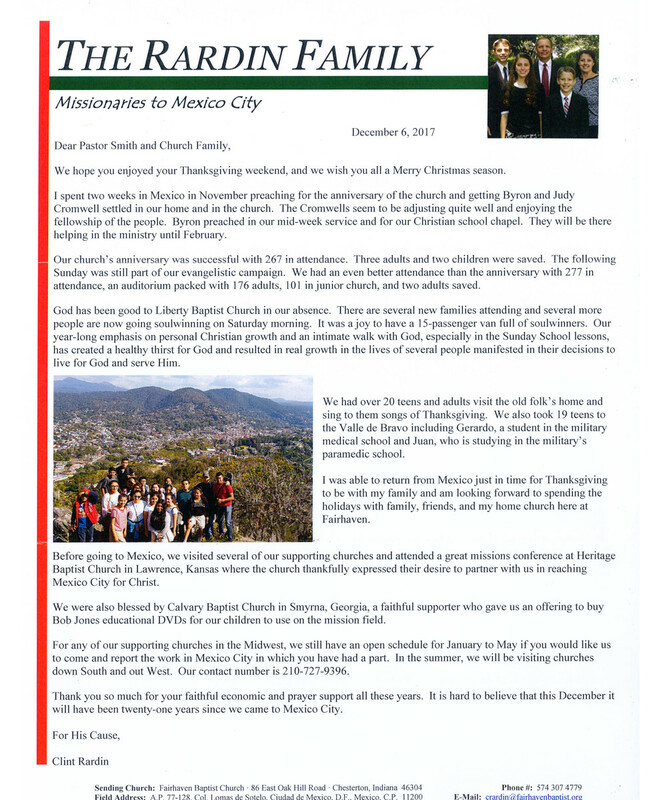 The Mexican missionary to the Jews who attends our church brought some Jews out this Sunday and has about ten Jews lined up to come this Sunday. Please pray that God works on their hearts and others this week's Friend Day. I am pleased with how many more wanted Friend Day invitations to give out this week. We had so many who wanted an invitation, we had to print more. It was encouraging on Thursday night prayer meeting to see so many more than usual filling up the auditorium and praying for this Sunday. We go into the weekend with great expectation about what God will do. Please pray for Kid's Day as well on April 30th. Our goal is to break our record and have over 400 in church. We are passing out 14,000 invitations, Our campaign's slogan is "Casting the Net". That is exactly what we have plans to do that week.